How to paint Captain America. 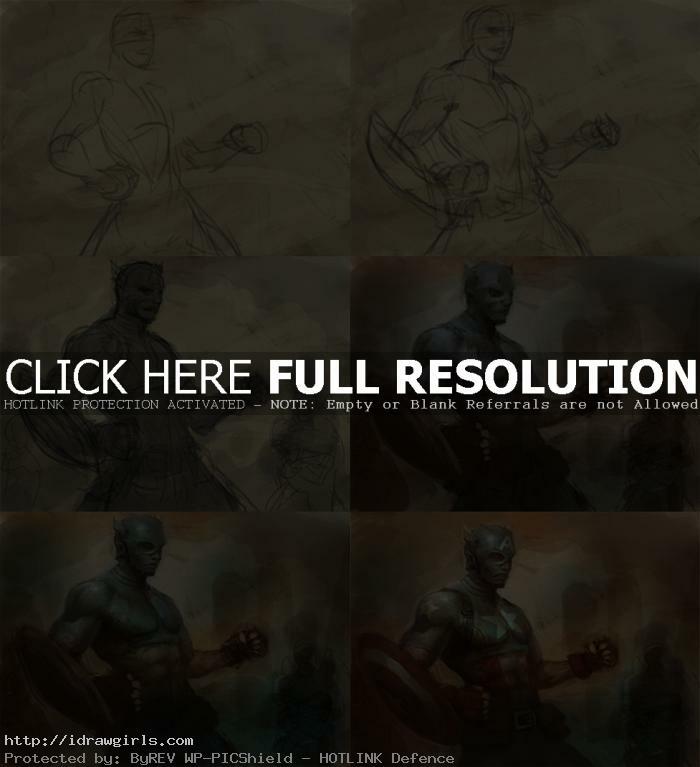 Learn to draw and paint Captain America with video instruction and step by step tutorial images. Superhero art tutorial Captain America. I decided to draw and paint another one of the Marvel super hero in the same style as Thor I painted earlier a couple weeks ago. Now I am focusing on the consistency of the art style and direction because most of the time my painting direction is all over the place depending on whatever inspire me at the moment. It can be good when you study and observe, but not so good as a presentation to show the consistency of your work. I am hoping to do more of superhero art tutorials in the coming weeks. Anyway, I am really excited to see, other than Thor the movie, what they will do with Captain America in the “Captain America The First Avenger” the movie which of course will feature the Captain. Then there will be “The Avengers”, hopefully, and the team will include Captain America, Ironman, Thor, and the Hulk as far as I know. Hopefully, it will turn out alright. A bit of Captain America’s story, Based on the Marvel Comics character from World War II. A brave, yet mild-mannered young soldier named Steve Rogers, volunteers to undergo a series of experiments for a US army Super Soldier program. The military succeeds in transforming him into a human weapon. Then a Nazi plot reveals itself Rogers must rise up and and become the First Avenger. Later, during a mission to Germany to stop his archenemy – The Red Skull. The Avengers are a team of superheroes, appearing in magazines published by Marvel Comics. The team made its debut in The Avengers #1 (Sept. 1963), by writer-editor Stan Lee and artist / co-plotter Jack Kirby. The original members of the Avengers originally consisted of Ant-Man, Wasp, Thor, Iron Man, The Hulk, and Captain America. The rotating roster has become a hallmark of the team, although one theme remains consistent: the Avengers fight the foes no single superhero can withstand. Here is a quick painting of Captain America, the first Avenger. Watch drawing and painting video tutorial Captain America. 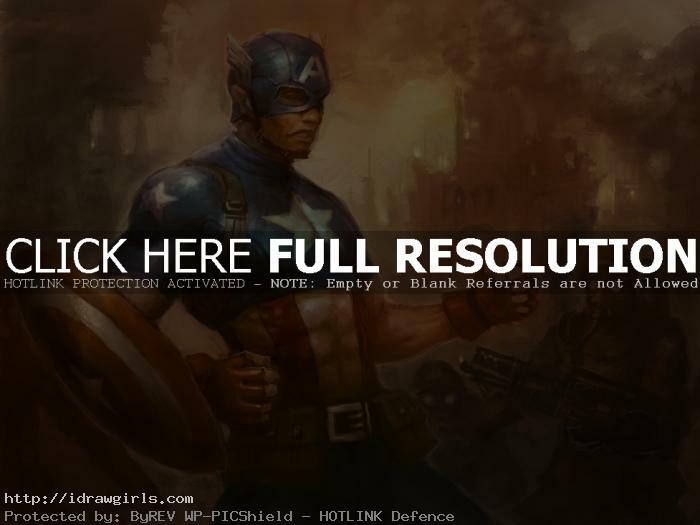 Below are step by step images how to draw and paint Captain America. Step one, I came up with a rough gesture drawing. The initial drawing is very loose and mostly use to guide us for the pose and body structure. Step two, I use the establish gesture drawing to create a more refine drawing of his head, body and some muscle structures. Step three, I filled in the figure silhouette with medium gray. Step four, I introduced some blue into the image and begin to set up basic light and shadow using value. Step five, at this point, I can render out his mask, face and body more in detail. Step six, then I can paint his shield, stars on the chest and shoulder. Also I painted some red onto his design and gloves. Now we are almost finished. You can watch the painting video for more detail instruction. Real good tutorial. I’m just getting back into digital painting.